It's a stationary bike, which is often used by athletes, to maintain stamina. It can be a sport that ignites motivation. The reason is, every 30 minutes, we can burn 334 calories by riding this bike. Skipping are inexpensive and fun way to burn 320 calories per 30 minutes. Not only that, this exercise can be done anywhere. skipping can help to increase your heart rate and burn more calories, compared to jumping without using a rope. Skipping involves lots of big muscles so that optimal calorie burning. 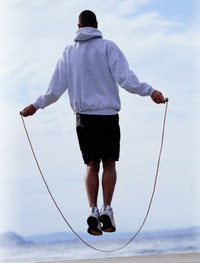 To be more challenging, as you have advanced in Skipping exercise, try to get a friend to join. If you are proficient, then we can try with two straps that particular formation so that any movement will flex your muscles. Dancing makes our bodies perform high intensity movements to the music. This will make our muscle tissue is formed optimally. Not only the muscles that form, but also every 30 minutes there will be 255 calories lost from our body. To improve the level of training, every time there is a movement of his feet, try to raise it 5 inches higher than before. Swimming is one sport that can easily build muscle out of the water. 30 calories burned per minute is 223 calories. If you want to raise the level of our swim, try variations of movement. swimming involves more muscle so that it can achieve the maximum calorie burn. Swimming is also training coordination, strength, and breathing.